Craig Kimbrel is having a rough playoff stretch. For the fourth time this postseason, the Red Sox pitcher made it out of a save by the hair of his chin. That wonderful red chin. 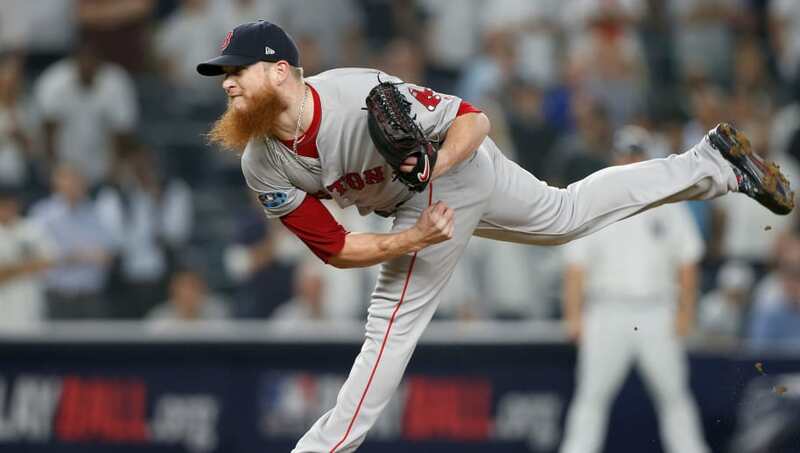 Kimbrel had an amazingly disappointing statistic in Boston's game 4 matchup against the Astros. Craig Kimbrel continues to make bizarre postseason history. In his save last night, he allowed SIX Astros to reach base. How many other pitchers in postseason history have had saves of 2 IP or shorter and let that many hitters reach base? Right you are. That would be none! In his two innings during the ALCS game, ​Kimbrel allowed six ​Astros to get on base. Six. That right there is a record. That right there is a record no one should be proud of. The Boston closer has declined in a surprising fashion, being all but serviceable during the team's playoff run. With the bases loaded in the bottom of the 9th, Kimbrel looked to Andrew Benintendi to save his hide, coming down with a beautiful diving catch. During each of his four saves during the playoffs, he has given up at least one run and allowed the game to get too close for comfort. Now, he's letting six players reach base. We knew that the Red Sox bullpen was struggling, but this is awful.